~ What’s with the name? Well, Spohr is our last name. It is NOT pronounced “SO-FER” or “SPORF” or “SPHORE”. It’s pronounced SPORE. According to Wikipedia, a spore is a reproductive structure that is adapted for dispersion and surviving for extended periods of time in unfavorable conditions. Like us, only spelled differently. And, ya know…not poisonous. Usually. ~ Remember after 9/11 when there was that big anthrax spore scare? Oh yes, we remember. Mike thought all your jokes were hilarious. ~ Do you read all the comments? Yes, I do. Even when I have a ton. Even when the post is days/weeks/months/years old. I read every.single.comment. ~ What is your favorite kind of pie? Custard. Please make me one. ~ What kind of dog is Rigby? Rigby is a Maltese, and she is FEMALE. You can read more about her here. ~ What do you and Mike do for a living? Mike is the Parents Editor at BuzzFeed. I am a freelance copywriter, and the Los Angeles Editor at Mommy Nearest. ~ What kind of camera do you use? ~ How did you and Mike meet? At a drag queen karaoke bar. What, isn’t that where everyone meets? ~ Can we be friends? ~ Hey, I just saw a picture of you/your kids/your husband/you took on BuzzFeed! Did you know about that? Yes, probably – Mike is an Editor there, and he often uses my pictures in his posts. However, if you see a picture of us that you recognize and think I probably didn’t give permission to use, please let us know! ~ Who is Jackie and what happened to her? Jackie is my best friend from college. She passed away from a brain tumor in 2012. I miss her so much. You can find out more about her here. ~ If I saw you on the street, could I say hi? PLEASE DO! I write here to connect with people. If you see us “in the real world,” please come say hi so I can give you a hug. 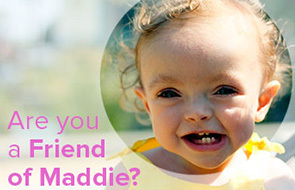 We started calling Madeline “The World-Famous Maddie Moo” when I was on bedrest with her. People all over the world emailed us to say they were sending good thoughts and prayers. It was amazing! “The Amazing Annabel” came about because of the amazing light she brought back to our lives. “The Joyous James” was named similarly – he gave us joy after a very rough year. ~ What kind of sewing machine do you use? I have a Brother CS6000i sewing machine. It was the machine I was assigned when I took a sewing class in 2013, so I stuck with what was familiar. It’s very easy to use and I definitely recommend it. It’s almost ALWAYS on sale via Amazon.com so definitely check it out there. ~ My friend has a child in the NICU. What can I do? I wrote a post about what to do in this situation, you can find it here. Don’t forget to tell your friend congratulations on the new baby! ~ What kind of clotting disorder do you have? I have something called Antiphospholipid Antibody Syndrome. So far, it’s only a problem for me when I’m pregnant. I’ve written about it specifically here and here, and all of my posts about it are here. ~ Are you on Twitter or Facebook or Pinterest or Instagram and do you accept friend requests from blog readers? I am and I do! I’m @mamaspohr Twitter, Pinterest, and Instagram, and you can find me on Facebook here. ~ Do you accept blog ads? I do indeed. Email me at thespohrs at gmail dot com and we can get down to business. ~ Do you do speaking engagements? Sometimes. Please email me at thespohrs at gmail dot com so we can discuss what you have in mind. ~ How can I be a blogger? Anyone can be a blogger. My advice is to write all the time. I write every day, and I have since 2002. The more you write, the better you’ll get. Write, write, write. And love it. If you don’t love it, don’t even start. I didn’t have comments on my first blog, or my second blog. I blogged without any feedback for five years, because I loved it. I still do. ~ Do you do product reviews? Occasionally, and if I do, there has to be something awesome in it for my readers. Feel free to pitch me if you think your product meets that strict requirement. Also, please know that due to the large number of pitches I receive, I only have the time to reply to relevant requests. Thanks for understanding! ~ How can I contact you? Head on over to my contact page for all that delightful information. ~ Who is your favorite Muppet? Have another question? Send it over to thespohrs at gmail dot com.